Arrive in Quito, the capital city of Ecuador. You are welcomed at the airport and transferred to your hotel. The rest of the day is at leisure. 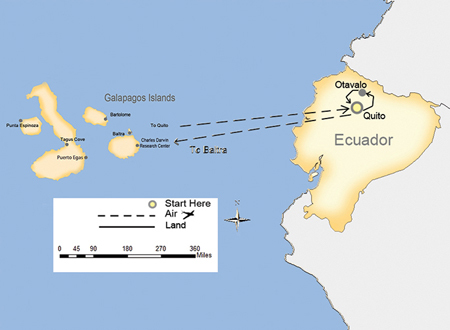 Today you will depart Quito and board a plane for Baltra. A guide will pick you up from the airport for a short ride to the pier to board the cruise from Whale Bay. Dry landing in Puerto Baquerizo Moreno, the capital of the Galapagos Islands. Passengers visit the Interpretation Center, an excellent place to learn about islands' history in The Museum of Natural History which displays information about the volcanic origins of the islands, their remoteness from the continent, ocean currents, climate, the arrival of the different species and their colonization, among other points of interest. The human history is also showcased, chronologically narrating the most significant events related to the discovery and the island's colonization. Wet landing on a beautiful white coral sandy beach guarded by a colony of sea lions. There are no trails, so we stay along the shore where we can spot Galapagos hawks, American Oystercatchers, Galapagos Ground Doves, Hood mockingbirds, Yellow Warblers, lava lizards, marine iguanas, and three species of Darwin's finches: a subspecies of the Large Cactus Finch, which is similar to the large ground finch, the Small Ground Finch (Geospiza fuliginosa) and the Warbler Finch (Certhidea Olivacea), another endemic subspecies. Swimming and snorkeling offer a great variety of the Galapagos' marine wildlife: king angelfish, Creole fish, damsel fish, parrotfish, manta rays, and white-tipped reef sharks. Wet landing. Located on the north side of Floreana, the bay was named because in 1793 Captain James Colnett installed a wooden barrel which served as an informal post office for sailors passing through, who would take letters with them back to their destinations. Today, visitors continue the tradition by placing unstamped postcards inside the barrel, hoping that some other traveler, going to the letter destination, will take it back for free. The chances are that the letter posted can take a long time to arrive at its destination. However, there have been cases where it has arrived before the sender. We may also encounter Darwin's finches, Yellow Warbler and Lava Lizards. Great snorkeling opportunities with Green Pacific Sea Turtles. As well, the island is best known for its endemic vegetation: Scalesia villosa, Lecocarpus Pinnatifidus, and the Galapagos Milkwort. Snorkelers can practice on the main beach among playful sea lions. Dry landing. We visit the Station where the Galapagos giant tortoise breeding program takes place as part of our efforts to preserve the fragile Galapagos environment and where the famous Lonesome George (the last surviving specimen of his species) lived for decades. Admire a prickly-pear cactus forest and variety Darwin's finches and other land birds. The Darwin Station also works providing environmental education to the communities, schools, and tourists visiting the Galapagos Islands. You will also have some free time to visit the town and shop for souvenirs. 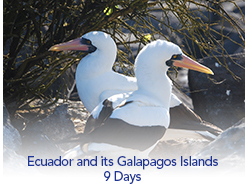 This is a rocky cliff offers the great opportunity to explore more the various marine biodiversity of the islands. Do snorkeling among a variety of colorful fish, stingrays, and if lucky, there could be the chance to see the magnificent White tipped shark. Great snorkeling opportunity off the beautiful white sand beach of Gardner Bay (Española). Baggage handling at airports – one piece - 44 lbs maximum per person and a soft bag.